Taking stem cuttings from a fruit tree is a method of propagating new trees that are an exact duplicate of the mother tree. Fruit trees propagate best by cutting softwood or semi-hardwood stems from current growth found on the upper portion of the tree. Take softwood cuttings from the fruit tree during the late spring months and slightly mature semi-hardwood cuttings in mid-summer. Use caution while taking the cuttings to prevent damage to the tree. Cut a 6- to 8-inch semi-hardwood or softwood branch section from current year growth on the fruit tree. Softwood cuttings are stems beginning to mature and snap easily. Semi-hardwood stems are beginning to harden and turn woody in appearance. Fill a large bowl or bucket with rooting medium. Slowly add water to the medium while mixing it with your hands until the texture is similar to a damp sponge. Fill a rooting tray with the moist medium. Remove all leaves and stems from the bottom half of the cutting. Dip the bottom end of the fruit tree cutting into rooting hormone and tap it lightly to remove excess. Stick the hormone end of the cutting into the rooting tray to cover the leafless portion of the stem. Press the medium around the cutting to hold it in place. Space the cuttings so the stems and remaining leaves do not touch. Mist the fruit tree cuttings and rooting medium with water and cover the tray with a plastic bag to increase the humidity level around the cuttings. Place the tray in a warm area that has indirect sunlight. Verify roots have formed by pulling on softwood stems after three weeks of growth and semi-hardwood stems after six weeks. Resistance when pulling on the stems signifies roots are present. Poke a finger into the medium to estimate the root length. 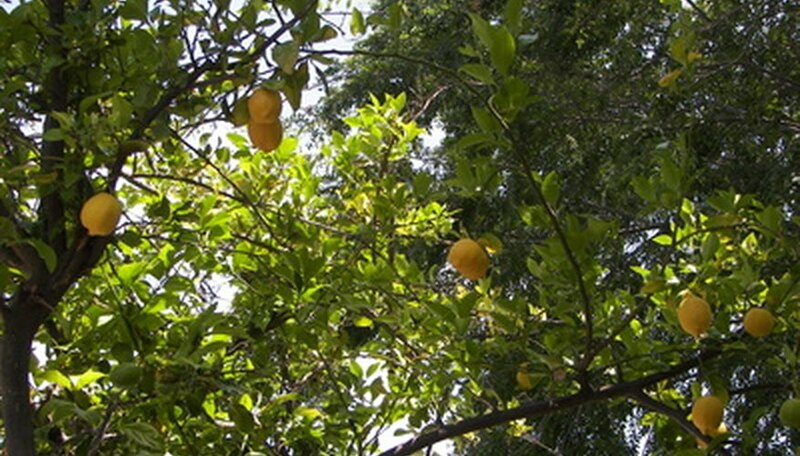 Transplant fruit tree cuttings once the roots are a minimum of 1 inch in length. Fill 4-inch growing containers with a well-draining potting soil and gently plant one cutting into each container at the same depth they were growing in the rooting tray. Grow the fruit tree cuttings indoors for a minimum of one year until the stem and root systems are strong enough to grow outdoors.